"Which would you like; A crown of lilies or a crown of thorns?" Those devoted to St Gemma will certainly appreciate the beautiful old holy card (to the left) that I just received yesterday from a collector in Italy. It depicts the scene related in one of Gemma's letters to Ven. Padre Germano Ruoppolo where Gemma relates an occurance that had just happened to her. My Father, all is finished. Yesterday evening at midnight Mass [Christmas], when the priest came to the Offertory, I saw Jesus, Who offered me as a victim to the Eternal Father. I was very happy. He pressed me to Himself; then He led me to our Mother and presented me to her, saying, "This dear daughter of mine you must regard as a daughter of My Passion”. Father, my heart still continues the violent palpitation. The blessed Angel, on Thursday evening, just before I began to suffer, came again. Together we adored the majesty of God Who gave me then so lively a sorrow for my sins that I felt ashamed at finding myself in His Presence, I tried to hide myself, to flee. I endured this torment for some time, but the Angel then gave me courage; He took from his breast a sword and let me see it, and said that Jesus soon would put it through the cross in my poor heart. He had two beautiful crowns; one of thorns and one of lilies. He asked me which I wished. I wished to obey you, Father, and did not answer at first*. Then I said, "That of Jesus." He raised the crown of thorns; I kissed it many times, smiling and weeping, and then the Angel went away...."
Regarding Gemma and the crown of thorns, Jesus often appeared to Gemma on Thursday nights, and He would take His crown of thorns off His head and offer it to her, that she might suffer in union with Him for the conversion of souls. This evening at last, after six days of absence of Jesus, since it was Thursday, I began my hour of prayer*, thinking of Jesus on the Cross. Then it hap­pened. I found myself with Him suffering and I felt a great desire to suffer and asked Jesus to give me this grace. He granted it; He approached me, took from His head the crown of thorns and placed it upon mine, and then went aside. I looked at Him silently for I was think­ing; Perhaps He did not love me any more, because He had not pressed the crown down hard upon my head as He had done at other times. Jesus understood and pressed it upon my temples. They were painful but happy moments. I then spent an hour with Jesus. I should have liked to continue with Him thus all night, but Jesus loves obedience very much; He Himself always submits to obedience, so when the hour was up He left me. Generally Jesus took the crown off when He was leaving; this time, however, He left it until about four o'clock the following afternoon. "...In the meantime, here I am at Thursday evening. Oh God! All my sins are paraded before me. What an enormity! Yes, all of you should know; my life until now has been a continuous series of sins. Always I see their great quantity, and the malicious intent with which I committed them, especially when Thursday evening approaches; they parade before me in a manner so frightening that I become ashamed and unbearable even to myself. So, especially that evening, I make resolutions and repent continuously; but then I keep none of them and return to my usual ways. A little strength, a little courage comes to me when I feel Jesus at the hour when he places the crown of thorns on me and makes me suffer until Friday evening, be­cause this I offer for sinful souls, especially my own. This is how things went yesterday evening, Thursday; I thought Jesus would do like usual that evening: He placed the crown of thorns on my head, the cause of so much pain for my beloved Jesus, and left it there for several hours. It made me suffer a little but when I say suffering I mean taking plea­sure. It is a pleasure, that suffering. How He was afflicted! And the cause: for the many sins committed, and the many ungrateful souls whom He assists, only to receive in return exactly the opposite. Of this ingratitude how much I feel guilty myself! For sure, Jesus must have been thinking of me." "Gemma's occurrences are becoming ever more serious. Last Thursday she suffered very much. Around 9pm, Jesus placed a crown of thorns on her head. You should have seen the blood! Eyes, forehead, temples and nose- they seemed like fountains. I soaked two handkerchiefs full of blood; you should have heard the kind of labor coming fromunder those ribs,….but what was it?" "....together with the flagellation there was also the coronation. I saw her like this one evening and I became frightened. She was in bed and I could see only her head. Blood was flowing in drops from her forehead and from her eyes like two tears that were congealing. Also, from her nose two rivulets descended to under her neck, forming there a small pool of blood." "...He placed the crown of thorns on my head, the cause of so much pain for my beloved Jesus, and left it there for several hours. It made me suffer a little but when I say suffering I mean taking plea­sure. 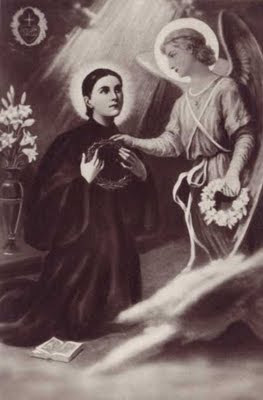 It is a pleasure, that suffering...” –St Gemma Galgani. Her words and example are so beautiful. I believe St. Gemma has reached out to me, and slowly my hardened and sinful heart is melting. Thank you for your website. I hope and pray that one day the Lord will give me the grace to love Him the way she did. I am so glad to hear that you enjoyed this article. St Gemma is indeed a great example for us on how to love God. Me we, with her help, learn to love God with all our hearts like she did!